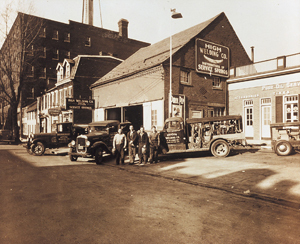 In 1931, High Welding Company, the forerunner of the High companies, began at this location on Lemon Street in Lancaster, Pa.
From our humble start as a Depression-era welding shop whose technological leadership would revolutionize bridge building, to our current status as a vibrant, diverse, and growing organization of business units, the High®companies always have been committed to innovation, industry leadership, environmental stewardship, and helping meet the needs of our community. While our headquarters and organizational roots are planted firmly in Lancaster County, Pennsylvania – a distinctively hardworking community that strongly influences the character of the High companies – our values-driven approach including hard work, trustworthy relationship-building, and innovative leadership, is shared by High co-workers all throughout the eastern United States. At the High companies, we actively seek a strong role in the betterment of our community through the generous volunteer culture of our employees and the philanthropy of High Foundation – our nonprofit organization committed to addressing significant community needs including affordable housing and homelessness, education, health and human services, and culture and the arts. Our environmental commitment is anchored by a comprehensive Green Initiative, a multi-faceted effort across all of the High companies to minimize our carbon footprint, conserve energy, and provide products and services to help customers achieve their sustainability and environmental objectives. Whether creating green-friendly properties, revitalizing historic structures, or carefully managing our own resources, the High companies continue our long history of responsible stewardship. We began our work in 1931 with firmly established ethical standards and a strong belief in quality, innovation, and integrity. To this day, those guiding principles and our dedication to customers, employees, and our world continue to drive our success..